Please join me in giving a special THANK YOU to these three sponsors who have generously contributed to the NGO I founded, Point Hope, a voice for forgotten children. The Butterfly Circus | Life is full of second chances and the ability to be happy not because of how others define you, but how you define yourself. The Butterfly Circus is donating a portion of all sales to Point Hope. Such a blessing to those we care for; I'm eternally grateful. This delightful short film is about The Showman, Mr. Mendez, who travels with his Butterfly Circus across a sad and dreary American landscape during the great depression. Along the way he spreads hope and opportunity for a second chance at happiness. It is a wonderful story to share with your family, not just during the holiday season but the whole year through. Grab some popcorn, your top hat (I'm sure you keep one handy) and find your seat for a big top adventure. This holiday season, Puracyn® Plus continued their efforts to give to those who need it most; every purchase of Puracyn® Plus will be matched by a product donation to Point Hope. In an area of the world where there is very little medical care available, living conditions are often unsanitary, and small scrapes and abrasions turn into major medical crisis, Puracyn® Plus has been a God send. I cannot thank them enough for their generous support to the children that Point Hope cares for and others around the world! Take advantage of savings on Puracyn® Plus and pay it forward for Point Hope. This Christmas season Balsam Hill is partnering with Point Hope to ensure children in West Africa have a safe happy life. Giving as gracious and welcomed as their beautiful holiday decor! For every interaction with the post such as a comment, share and like, Balsam Hill will donate $0.50 to support our cause. The campaign will kick off on the 5th of December and run through the 25th of December. We encourage you to SHARE THIS POST with your friends as every dollar counts! Point Hope and Balsam Hill will both be posting about this campaign on our social media channels such as Facebook, Instagram & Twitter. And while you're at it, please tell us about a personal experience with Christmas charity, given or received. 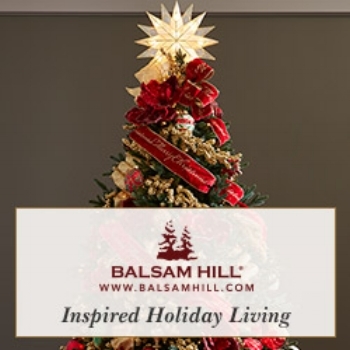 Read more on Balsam Hill's Meaningful Christmas HERE. Simply stunning artificial Christmas trees, wreaths, and garlands made at the highest quality. Free shipping site-wide for all Christmas tree products. Once again, I'd like to thank these three generous sponsors who have taken the spirit of Christmas to heart and are giving to those most vulnerable and in need! To learn more about Point Hope and what they do, visit their site today. Join Point Hope in helping the children at Buduburam Refugee Camp get an education. $30 enrolls a child in school for one year. Make a difference in a child's life today. In 1993, the original Point Hope was started as she met a homeless mother who was living on the streets with her kids and sleeping in cardboard boxes. Delilah started a street mission to distribute food, clothes and blankets to homeless people in Philadelphia, where she was still living. Delilaha’s main goal was to distribute information to people so they could make better choices for themselves and their children. Most of the homeless population lived on the streets due to alcoholism, drug addiction or mental illness, as is still the case. Delilah’s friends and she would make tuna fish sandwiches and go downtown every Wednesday , hand out the sandwiches, as well as clothes they had collected, and distribute pamphlets with Alcoholic Anonymous (AA) and Narcotics Anonymous (NA) meeting schedules, as well as shelter locations for women and children. When Delilah moved to Seattle in 1997, Point Hope went on hiatus as she focused on her own growing family. Delilah went from being a mother of two to a mother of seven in a short time span. Four of her children were adopted out of the foster care system, and she learned what a horribly abusive system it is. She advocated for change and spoke out against the status quo. Then in 2004, something happened that further changed Delilah’s world. A single woman in West Africa wrote an email to Delilah from an internet cafe’ located in a building most of us would consider a shack. Delilah read the appeal from the woman. She was asking for help caring for her two starving children living in a town called Buduburam where there was a Liberian refugee camp in the country of Ghana. Delilah felt God telling her she had to check out this story. She quickly learned the truth of what the woman told her. The United Nations had sponsored a refugee camp of Liberians since the first civil war of 1990. Initially over 80,000 people had come to the camp which was equipped for a population of 4,000; when Delilah stepped into that camp in May 2004, mere weeks after receiving that first email, she found more than 60,000 people living there. Instead of two little children needing help, there were more than 10,000. She also discovered there was no fresh, running water. Instead, children were being sent down inside sewage ditches to make a small pile of rocks and pebbles to filter the water, collect it and hand it up to the adults waiting in the line to collect it. Or, for those people who were able to afford the expense, water trucks would drive into camp delivering dirty water dredged from a nearby lake for a price. Water borne diseases were rampant and there were children dying daily. Point Hope was reborn in the U.S. and also assisted in establishing PointHope Ghana, its sister Non-Governmental Organization (NGO) needed for work in West Africa. Today, Point Hope has grown from a handful of friends gathered around Delilah’s kitchen table making hundreds of tuna fish sandwiches for hungry families, to a non-profit organization that helps refugees in Buduburam and the surrounding district, helping the community there each month by nutrition, funds for education and access to medical care. What does a volunteer in West Africa look like? What does a volunteer in the US look like? What would a volunteer in West Africa or the United States do? This would depend on your skills, interests, and training. Are you a doctor or a dentist? Serve as a medical or dental consultant. Donate your services as an architect! Design future children’s homes, offices, schools, ministry centers, etc. Construction-related skills? Donate your services (builders, plumbers, electricians, etc.) here in the US (at our local offices) or travel to one of our countries to work on a project. In the medical or pharmaceutical field? Gather much needed resources including medicine, vitamins, medical tools/machines, etc. Food is one of our children’s greatest physical needs. Are you a farmer or agriculturalist? Impart your expertise to our farm staff or donate farming equipment. Sports enthusiast? Gather sports equipment or materials to construct sports courts, playgrounds, etc. Maintaining cultural values including traditional ethnic dance, storytelling and dress are important to us. Travel to one of our countries and serve as a consultant, offering advice on ways to encourage this in our programs. Experience or training in trauma or grief counseling? Serve as a consultant or travel to one of our countries and impart your knowledge. Are you an educator? Support Education (See Education below). Create culturally relevant Bible studies to send overseas. Develop VBS curriculum or activities to use in-country with our kids! Lend your expertise as a social services consultant. Get involved with worship! Point Hope always welcomes guest speakers and worship leaders to come speak at our prayer meetings in Washington (See Contact Information Below). Are you a pastor? Take a Venture Trip or serve as a consultant overseas. Are you a teacher or education professional? Work to identify educational needs. Run a school supply drive or a book drive, or help collect school supplies for children in Africa and/or children here in the US. Contribute to the planning, implementation, or funding of programs at our Vocational Skills Centers. Background in special education? Help us meet the needs of our children with mental and physical challenges. Become an advocate for global poverty. Provide pro bono legal services to our US organization or serve as a legal consultant. Donate your professional services as a financial advisor. Do you have connections to the media? Help Point Hope Reach out locally and globally. Create or edit video for use as an official use by Point Hope. Donate your time to a specific project in Graphic Design, Journalism or Web Development/Web Design. Professional photographer? Participate in special events held around the U.S. or travel to one of our countries to take photos for use in various publications. An artist or tradesperson? Travel to one of your countries and teach a class, creating an opportunity for a skill-based business opportunity. Interested in music? Setup the recording studio with musical instruments or create instrumental soundtracks, or a song dictated to Point Hope. Generate awareness regarding the environmental conditions in Africa and here in the United States Foster System. Share your expertise in areas such as water filtration, crop rotation, irrigation techniques, alternative power sources, etc. To be a voice for forgotten children. To raise awareness and champion the cause for forgotten children so that: Every child has a loving and nurturing environment. Every child has the basic essentials to live a healthy life. Local communities are equipped to deal with the challenges facing children. Government, business, education and religious communities are encouraged to partner for the welfare of children. Involvement with discernment. Fostering stability through authentic relationships. Partnering and collaboration that honors the sharing of success. Coming alongside already established local efforts where we can. Transparency in all matters of business. Long-term community transformation. Effective deployment of resources. Always value talent. 100% of contributions go to those in need. Embracing God in all we do. Care for widows and orphans in West Africa. Build a sustainable, modern village. Create ownership of the process by/for the residents of Point Hope Village; morph that into actual ownership of the village. Establish villages in other West Africa communities based on the Ghana Point Hope Village model. Establish Points of Hopeï¿½ across America. Be a light in the darkness. Change the world. The patients in the Buruli ulcer clinic badly need sterile bandages to protect from further infection after the wounds are healed, but the clinic has no funds to replenish the bandages. Instead, the patients must wash out their bandages and reuse them. We are seeking donations of medical grade gauze bandages, Kerlix antimicrobial bandages, Coban self-adhering wrap and latex-free nitrile exam gloves to stock the clinic. A wonderful listener just wrote to me and said she found all of these items at Drugstore.com at decent prices and had them shipped directly to Point Hope’s office. If you can help us stock the clinic with these much needed sterile supplies, we would greatly appreciate your support. There are a variety of different ways you can aid the mission of Point Hope. For example, have you ever considered a vacation that includes volunteer work? A little relaxation that’s good for the body and a little volunteer work that’s good for the soul – all wrapped up into one amazing, life-changing trip. It’s called a “sharecation” and you can learn more about it at PointHope.org.